DMMD’s patented interpolation results are shown below. DMMD is actively developing super resolution image enhancement algorithms. Super resolution image processing refers to the use of multiple low resolution images to produce an enhanced, higher resolution image. In some cases, super resolution also makes use of higher resolution training data. When using high resolution training, super resolution is often done using table lookups. 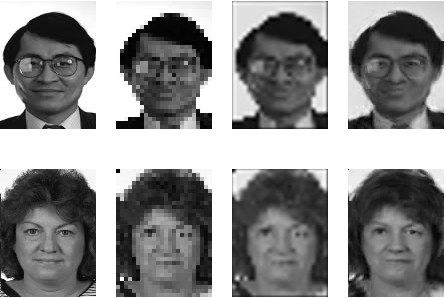 Image patches from the high resolution training data are matched with image patches from the low resolution input image. The table lookup process is often times a very time consuming process which must be performed for every input image. DMMD is interested in developing methods that "learn" to do supper resolution. Initially the algorithm might spend a lot of time on "learning" but then each new input image will be processed very fast. Preliminary results of our work in this area are presented next. One area of tremendous interest in recent years is face reconstruction. 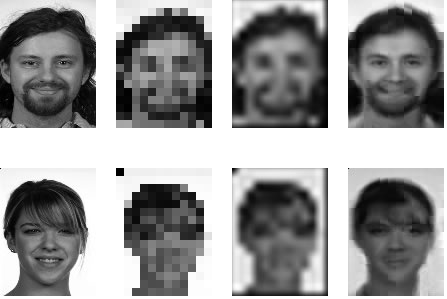 Here is a comparison of our preliminary results for the face reconstruction algorithm. The algorithm is very computationally intensive in the training stage, but is as fast as polynomial interpolation in the running stage. From left to right, the results are: the original, pixel replication, bi-cubic interpolation and DMMD’s reconstruction.